Archive of Creative Culture is a curious collection of books sourced from revered visual, performing and literary artists, musicians, curators and cultural figures. Each book in the collection is identified as being the “go-to” reference, source of inspiration or representation of a pivotal moment in the contributor’s life. The featured collection is sourced from nominations on behalf of the staff at the Museum of Craft and Design (MCD). 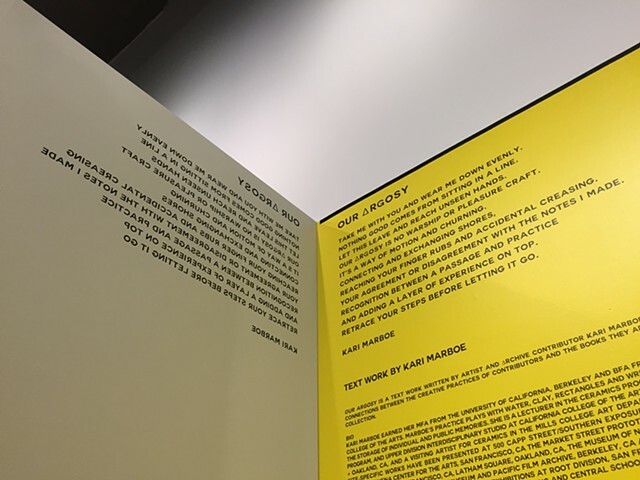 Imbedded behind the book display is a text-based work by artist Kari Marboe. Her text draws connections through all elements of the exhibition and weaves together memories stored in each book. Take me with you and wear me down evenly. Nothing good comes from sitting in a line. Let this leave and reach unseen hands. Our Argosy is no warship or pleasure craft. It's a way of motion and churning. reaching your finger rubs and accidental creasing. Your agreement or disagreement with the notes I made. and adding a layer of experience on top. Retrace your steps before letting it go.